Unique pieces and furniture with patina is a decorating trend that seem to be sticking around. 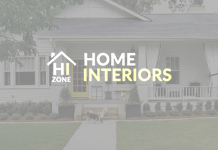 This is good news for those of us who like a trendy home on a budget. 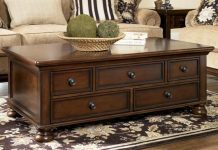 Upcyclingis the latest means to this end and can include finding tired old pieces of furniture and bringing them up-to-date. The concept is kind to the environment and challenges our creativity. 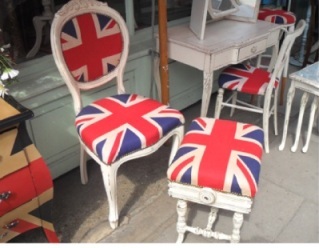 Chairs are excellent upcycling projects and second hand shops are full to the brim with them. Repairing old chairs is easier than you think, and once you’ve sand-papered the surface a bit, you can paint them in any colour you like. Don’t be afraid to go bold as you can always re-do them if you get tired of the colour. If your chair is upholstered, look for fabric in upmarket shops. Since most chairs only require a very small piece of fabric, you can afford something really spectacular. Many shops will sell left-over pieces cheaply and you’ll want to get a fabric that’s a bit thicker. 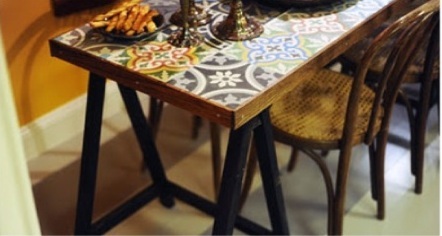 If you need a table to go with the chairs you can upcycle an old table by adding tiles to the table top. Moroccan tiles are beautiful and timeless but you can make gorgeous patterns with cheaper tiles as well. 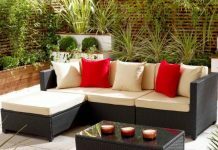 This technique can also be used to turn indoor tables into gorgeous garden furniture. Tiling your table is an easy and fun project and you can find detailed instructions on how to do it here. The fridge is one of those necessary evils of our homes. Simply being old and tired-looking isn’t reason enough to replace it if it’s still working. So instead place some wallpaper on it and transform your whole kitchen. 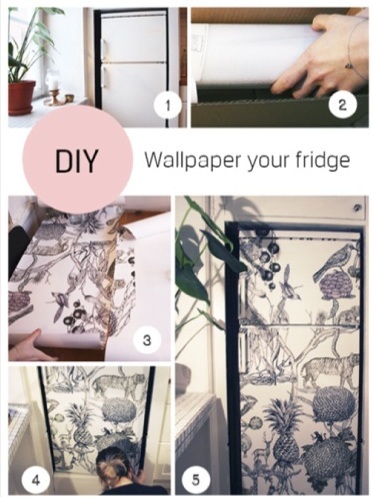 Not entirely convinced about the idea of using wallpaper on your fridge? Have a look at the example below. The end result is unique! 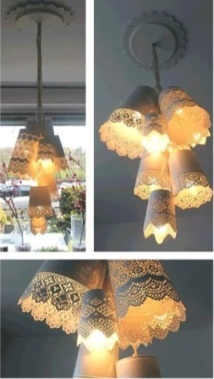 Designer lamps are expensive but with a bit of creativity you can turn ordinary items and cheap light fixtures into real gems. IKEA Hackers for instance created a spectacular ceiling lamp by drilling holes in cheap flower pots and attaching them all to a serving tray. Just make sure you are careful when working with electrical appliances. Your own creativity is the only limit to what items you can upcycle so next time you feel your home could do with something new, start by looking at what pieces could be transformed instead of replaced. The key is not to rush your upcycling projects but do it well and carefully, and don’t cheat on the prep work. If done properly your repainted chair and tiled table will look professionally made and designed.